Last week, I began the testing phase of recipes for my next cookbook A Taste of Kentucky: Favorite Recipes from The Bluegrass State (Farcountry Press 2016). For this project I have the good fortune of collaborating with a talented Kentucky photographer named Sarah Jane. Our Tuesday session was great fun. I cooked, while she chased the light around my house and photographed the finished dishes. The photographed pancakes are Buttermilk Pancakes with Whipped Bourbon Vanilla Butter from The Red River Rockhouse in Campton, KY. This is one example of a recipe we worked on last week. While shooting this particular photo, Sarah Jane instructed me to pour a thin stream of syrup onto the pancakes. While I poured, she took pictures of the syrup stream flowing onto the pancakes. It was a beautiful shot. 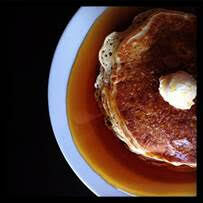 Just for fun, she also shot this picture of the resulting puddle of syrup around the pancakes. I call this Buttermilk Pancakes en Dolce Brodo (in sweet broth). A Taste of Kentucky should be a beautiful and delicious cookbook with close to 100 recipes from the best chefs, restaurants, inns, food producers, and writers across Kentucky. While you wait for this book, I share a pancake recipe from The Kentucky Fresh Cookbook. Try to control yourself with the syrup. Not made from a mix, these pancakes are a soft, fluffy, rather tall pancake. Vary the size if desired. For a 6-inch pancake use 1/2 cup of batter, for a 5-inch pancake use 1/3 cup batter, and for a 4-inch pancake use 1/4 cup batter, and for silver dollar pancakes, or pancakes the tiny size of a silver dollar coin, use a tablespoon to portion out the batter. When the weather turns cool during the fall here in Kentucky we head back indoors for most of our meals. The oven is lit and the warmth of the kitchen is a welcome relief from the air-conditioned air. If I’m lucky I can open the windows in the house during the day to let in the crisp fall breeze. October is a beautiful month to have a few friends over for dinner. When I host a dinner party it’s never very fancy, just a spread of freshly prepared food with delicious side dishes and a simple, seasonal dessert. A show-stopping dessert with a single butter crust covering the dark, spiced apple filling. Bourbon adds unique flavor and character to the apples but, vanilla extract can be substituted for the bourbon if desired. I find it necessary to post this recipe. It was and is the reason for several thousand visits to my blog. When I make Oven-Baked Chex Mix I know it’s the holiday season. I often switch out the bagel chips, this time for my beloved Cheeze-its. Let the Christmas season begin. What’s your favorite tidbit to pick out of the Chex Mix? It’s a good thing I clipped this recipe from the cereal box a few years ago. I noticed this year (and maybe this was true in recent years too) the recipe for Chex Mix included only a set of microwave directions. I’m a little funny about using the microwave to “bake” something. I’ve never tried making this in the microwave, but knowing what I know about roasting or baking I predict Chex Mix baked in an oven tastes better than Chex Mix stirred in the microwave. It does take a little longer, but that’s a wash in my opinion, because either way you have to cool the mix before eating. If you want microwave instructions just look on the back of a Chex cereal box. By the way, this recipe works perfectly fine with a store-brand Chex-type cereal if you so desire. Preheat oven to 250 degrees F. In an ungreased large roasting pan, melt butter in the oven. Stir in Worcestershire sauce, seasoned salt, garlic powder, and onion powder. 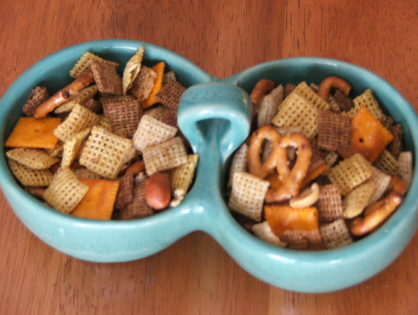 Stir in chex cereals, mixed nuts, pretzels, and bagel chips until coated. Bake for 1 hour, stirring every 15 minutes. Spread on paper towels until cooled. Store in an airtight container. After a few iterations I’ve settled on a recipe for garlic scape pesto from the garlic scapes I harvested in my garden. The only problem with any garlic scape pesto, is well, the flavor is quite garlicky. I was tempted to pick some basil from my doorstep herb garden to add to the pesto but then it wouldn’t be pure garlic scape pesto so I avoided the temptation. In an effort to mellow the scapes I used only 1/2 cup scapes and an equivalent amount of walnuts and parmesan cheese. It’s really quite good, don’t get me wrong, but think condiment such as spooned over a bowl of black beans and rice, or as a spread for hearty bread, or a small amount stirred with some hot pasta. 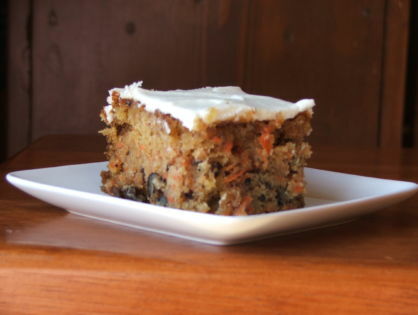 This dark, spicy cake is adapted from a Kentucky Proud recipe. For a sweeter taste, and a moister, pudding-like cake, add 1/2 cup sugar to the blackberries and let them stand 30 minutes before adding to the batter. I’ve baked this recipe with both walnuts and pecans, but I’m quite confident black walnuts would boost the flavor profile. Any cookie I can mix in one bowl is a quick and easy favorite. The dough is stiff, but the cookies are not-too-sweet delicious and they don’t spread much on the cookie sheet. 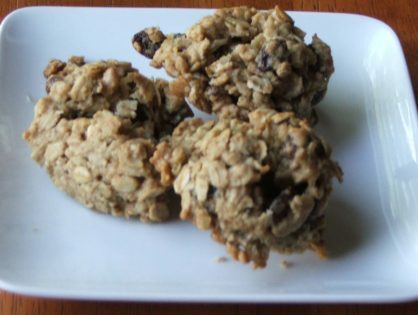 I also think there’s a good argument these cookies are appropriate for breakfast – they’re not loaded with sugar, you can’t beat the nuts, oat, fruit, and fiber. 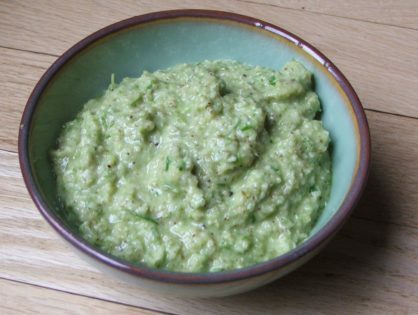 Blog stats reveal many of you ate up the recipe for Guacamole – Plain and Simple. Who doesn’t like plain and simple anything, afterall. For example, I love M & M’s, plain and simple, but I digress. Place all ingredients in a blender or food processsor fitted with a metal blade. Process until smooth. Scrape down the sides of the work bowl and continue processing until even smoother. 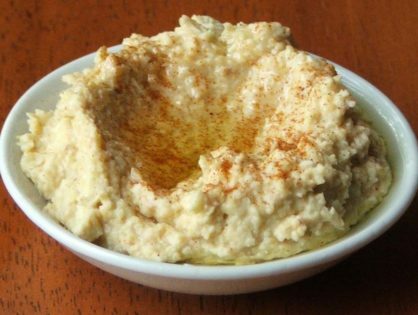 To serve in a more attractive way, spread the hummus in a shallow dish or pie pan. Sprinkle lightly with cayenne pepper or paprika. Drizzle with olive oil. Serve with pita chips, fresh sliced vegetables, or small pretzel rods. I haven’t slept well for the past several nights for two reasons. First, my 84-year-old aunt Mary, and the author of this recipe, is in the hospital. She is pretty sick with a bout of pneumonia and could potentially be in the hospital during what was always one of her favorite days to celebrate, The Kentucky Derby. It’s sad to see someone I care about weaken and grow sick, especially someone who gave of herself tirelessly for her family and in her work as an RN. Let’s hope she recovers and can return home. I also haven’t slept because in my previous post I told you I was going to bake some pies to take to a Derby party and then I carelessly left you hanging – no recipe for the pies. So, in Mary’s honor, and in order that you have a recipe for pie, I give you this family recipe for “Mary’s Bluegrass Pie”. (I could get into a legal battle if I called this by it’s real name.) My sister in Baltimore swears by this recipe when she hosts her Derby parties. If you want to get a little more fussy you can make small tartlets (or as Mary would say – piettes.) Press a small ball of unbaked pie dough into the cups of mini-muffin pans to form a crust. Then spoon a small amount of the filling into the mini-crusts. By that method the yield is about 48 piettes. Or you can make two 9-inch pies as described below. The best male cook I know is, bar none, the finest barbecue chef in Kentucky. (I know these are probably fightin’ words, but I stand by what I say.) Give him a few slabs of ribs, a beef brisket, or a pork shoulder, and in about 12 smoky, albeit labor-intensive hours, we’re eating fall-off-the-bone-tender barbecued meat. The secret is his patience and willingness to coax the meat into a moist, succulent state. I love him for this skill and have his late father Henry to thank for the many smoker-side cooking lessons. I’ve said it many times, and I’ll say it again, any lesson in a life skill, such as barbecuing (or how to iron a shirt), is a gift that keeps on giving. Knowing this background you can then understand why a slow-cooker pork barbecue recipe was met with a bit of resistance. The best male cook I know couldn’t imagine eating pork shoulder that hadn’t spent the latter part of its adult life simmering above hot coals. Despite his protests I persisted with my recipe. The resulting meat was tender, but admittedly not full of smoky flavor. It’s desirable, none the less, for feeding a crowd, or a hungry family, when you’re not able to hang out by the grill or in the dead of winter when it’s just too darn cold to tend the smoke-box. And, trust me, it beats in flavor, cost, and texture the tubs of pork barbecue you buy at the supermarket. So, if for no reason other than these, tuck this recipe in your recipe box. Just like a true, wood-fired smoking process, low and slow is still the rule. For best results, start either early in the morning or let the pork slow-cook overnight. In my (oblong) slow-cooker, set on low, the pork takes about 11 hours to reach a fork-tender state. The first time you try this recipe I suggest checking the tenderness of the meat after about 10 hours to gauge how quickly, or slowly, your slow cooker cooks the pork. If needed, cover the pork and continue to cook for up to 2 more hours. The jury’s out on how to eat pulled pork: We’re a sauce-it-when-we-eat-it family. Some like to mix sauce into the whole batch of pork before serving. Some like to sauce the whole batch, and then add more sauce on the top. Because of this, I try to offer a few options on when to sauce the meat. Summer’s on its way. 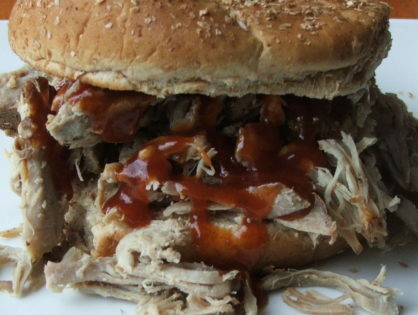 When you can’t take the time to tend a fire, but want tender, homemade pork barbecue, give your slow-cooker a try. Nothing holds a candle to home-smoked meat, but this works in a pinch, a large pinch of meat piled high on a bun that is. It’s that time of year. It’s Burgoo time. What I mean is: Keeneland is open. Keeneland serves Burgoo. It’s almost Derby Week. Everyone who celebrates Kentucky’s national holiday (the Kentucky Derby, the first Saturday in May) think s Burgoo. (And mint juleps, but that’s another story.) I created this recipe on a snowy day in March. 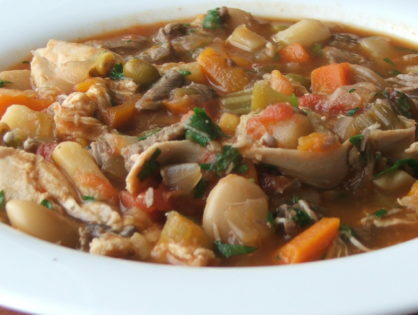 It’s not a quick recipe, but one where you first make a broth using beef, lamb, and dark-meat chicken pieces. Then you cook the vegetables in the broth and add the cooked meat. The two-step process ensures tender meat and nicely cooked vegetables. It’s even better reheated, so feel free to make this recipe ahead, and reheat before serving. Incidentally, if you’ve ever wanted to attend a Burgoo Festival, make plans for September 2009. Trim excess fat from beef shank and lamb. Place the beef, lamb, and chicken pieces in a 6-quart Dutch oven. Add salt and water. Bring to a boil over high heat, skimming off any foam that rises to the surface. Reduce heat, partially cover, and simmer for 45 minutes. Remove the chicken pieces to a plate. Partially cover again, and contine to cook over low heat until the beef and lamb are fork-tender, about 1 1/2 more hours. Remove the beef and lamb to the plate with the chicken. Let the broth cool slightly. Strain and measure the broth. Add water if necessary to make 6 cups. Wipe the sides of the oven with a paper towel to remove any remaining skum or foam reside. It’s not pretty to get this stuff in your stew. So wipe it off and save yourself from having to use another pot, or wash this one. Very easy and quite delicious, this versatile salsa is quick to put together. The chipotle pepper adds a smoky flavor, but if chipotle-seasoned tomatoes are not available, use plain petit diced tomatoes and add either chopped chipotle or jalapeno pepper, to taste. Save some salsa to serve with burritos or on a grilled piece of chicken or fish. Fresh or frozen corn can be substituted for the canned corn. 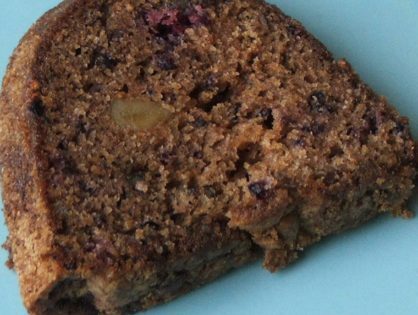 As part of my ongoing efforts to keep you in the kitchen, I offer this recipe for banana bread. I can’t shed too much new light on banana bread except to say this recipe combines the whole-grain goodness of whole wheat flour with some all-purpose flour. This flour combination keeps the bread from becoming too heavy and dense. If desired, 1/2 cup golden raisins can be substituted for the nuts, and if you don’t want any white flour you can always experiment and use all whole wheat flour. Judging from the popularity of Winter Wheat Berry Salad, I am offering a recipe for another whole-grain salad. This delicious dish has been part of my repertoire for over 20 years and I’ve made it many, many times. It travels well to a potluck and tastes best served at room temperature – and that’s a bonus if the weather is warm. A moist cornbread studded with chilies, cheese, and corn. Two cups fresh or frozen corn kernels can be substituted for the creamed corn, if desired. If you want extra-spicy cornbread, substitute pepper-jack cheese for the cheddar. Let’s try again. The paragraphs in the original post were out of order. It’s funny, but when I formatted the recipe the first time I kept having trouble with the breaks between the ingredients and the instructions. I guess a few other important things got messed up as well. My astute readers Sharie and Frances were paying attention. Away we go with the new and reorganized recipe. I promise these will taste better if you cook the potatoes before you mash them! We eat these potatoes quite a bit, but I have yet to take a picture. During the winter it’s dark here when we eat dinner and the food photos don’t turn out well at all. Tonight the time changes, so we’re headed into evenings with more light! Now about the recipe – the fresh garlic mellows and tastes sweet when boiled with the potatoes. This is a dairy-free recipe where the simplicity of the potatoes shines through. Choose a thin-skinned gold-fleshed potato for the best results. I would imagine that a red-skin or new potato would work just as well. I typically don’t use russets or Idaho potatoes for this recipe. Scrub potatoes but do not peel. Cut potatoes into large chunks. Place potatoes and garlic in a 2 1/2-quart sauce pan and cover the potato with cold water. Bring to a gentle boil. Reduce heat and cook for about 25 minutes or until tender when pierced with a fork. Use a measuring cup to dip out and set aside about 3/4 cup of the cooking liquid. Drain the remaining liquid off the potatoes. Add the olive oil, salt, pepper, and reserved cooking liquid to the cooked potatoes Using a hand-held potato masher or large fork, mash the potatoes to the desired consistency. Taste and season with more salt and pepper if desired. Don’t stress out if your cream cheese and butter aren’t at room temperature. All is not lost. It’s a little easier to make this frosting with softened cream cheese and butter but if you forgot to soften them, go ahead and proceed, just beat a little longer to achieve a smooth consistency before adding the confectioners’ sugar. One more word of caution: Be sure not to add to much milk. It’s much easier to make this frosting thinner by adding a titch more milk, but if you add too much milk then it takes a lot of sugar to thicken the frosting back up, not to mention how the excess sugar deadens the flavor of the cream cheese. OK, finally, the split vanilla bean is completely optional. I like to add the vanilla bean flecks when I have one on hand to make the frosting look like fresh vanilla bean ice cream. Place cream cheese and butter in a mixing bowl. Beat about 3 minutes with an electric mixer until fluffy. Stop the mixer and pour in the sugar and vanilla. If using, scrape the vanilla specks out of the bean with the edge of a small paring knife and add to the cream cheese and butter, too. On low speed, beat in the sugar and vanilla. Turn mixer to medium-high and continue to beat until smooth. With the mixer running, gradually add 1 tablespoon of milk and beat well. If too thick to spread, gradually add more milk as needed until soft and more spreadable. The test for frosting is it shouldn’t pull the top layer off the cake when spreading. That’s a total bummer. This cake is so homey. moist, and earthy. I just love it, so let’s have a group hug. 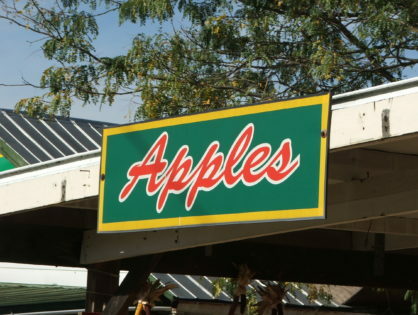 My recipe uses golden raisins and applesauce. If desired you can substitute 1 cup of coconut for the raisins, and 1 cup drained, crushed pineapple for the applesauce. Preheat oven to 350°F. Spray a 13 x 9 x 2-inch pan with non-stick cooking spray with flour, or grease and flour the pan. In a bowl, whisk together the flour, baking soda, baking powder, and salt. Set aside. In a large bowl stir together the sugar, oil, eggs, and vanilla. 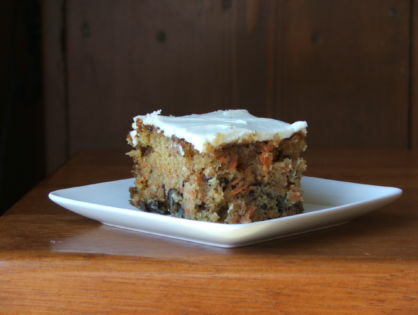 Stir in the carrots, nuts, raisins, and applesauce. Fold in the flour mixture until well combined. I’m proud to present, for the very first time, One Pan Blondie. This nutty companion to our brunette favorite – One Pan Brownies – is the perfect accompaniment to an afternoon cup of tea. Preheat oven to 350°F. Spray a 13 x 9 x 2-inch baking pan with non-stick cooking spray. Place flour, baking powder, baking soda, and salt in a bowl. Whisk to blend well and set aside. One of my favorite things to do is bake on a weekend morning. I went on a scone kick last winter when a neighbor told me she wanted to start baking Raspberry White Chocolate Scones instead of paying $1.89 a piece for scone at a local specialty market. Her favorite variety was Raspberry White Chocolate, so I baked many variations and shared the goods with her. In addition to gaining a few pounds we realized the market was using a thaw and bake dough from Pillsbury. Because we don’t have access to commercial bakery ingredients my scones never tasted exactly the same, but we did pretty good. This thick and hearty scone is quite tasty and even contains the whole-grain goodness of oatmeal. I have a thing for oats, but that’s a story for another day. Take some time early on a weekend morning to bake. If you don’t feel like scones try this yummy coffeecake. Your family will thank you. 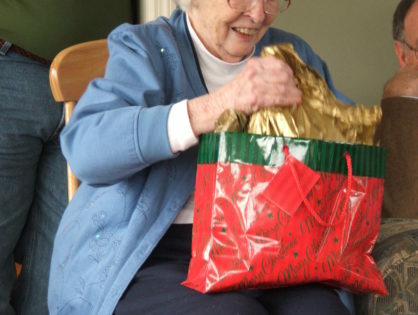 If you live alone, or somehow sense that your family can’t eat 16 scones, freeze the remaining scones in a heavy-duty zip-top bag or better yet – share the scones with your neighbors. It’s sort of like the new-fangled way to pass a cake over the back fence. Nothing says friendship like delivering a home-baked good to someone’s door. Note: Dried cranberries can be substituted for the cherries, if desired. For Apricot White Chocolate scones substitute 1 cup chopped dried apricots for the cherries and white chocolate chips for the semi-sweet chips.